^ J. J. C. Hoo (1998). 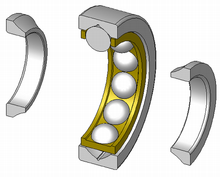 Bearing Steels: Into the 21st Century. ASTM International. p. 444–445. http://books.google.com/books?id=VQOVbmvTyxQC&pg=PA444&lpg=PA444&dq=%2B440c+%2B%22stainless+steel%22+%2Bdental&source=bl&ots=Wg4ARSn8NT&sig=Mzu3XTsoRvHEhnt9F_94tfBY1Hc 2008年11月18日閲覧。. ^ Speer, Albert (1970). Inside the Third Reich. New York and Toronto: Macmillan. pp. 331–347. ^ Brunner, Gisbert (1999). Wristwatcges - Armbanduhren - Montres-bracelets. Köln, Germany: Könnemann. p. 454. ISBN 3-8290-0660-8.